The children of today are rumored to be far more consciously adept than our previous generations. If that's true this might be a piece of supporting evidence of that. 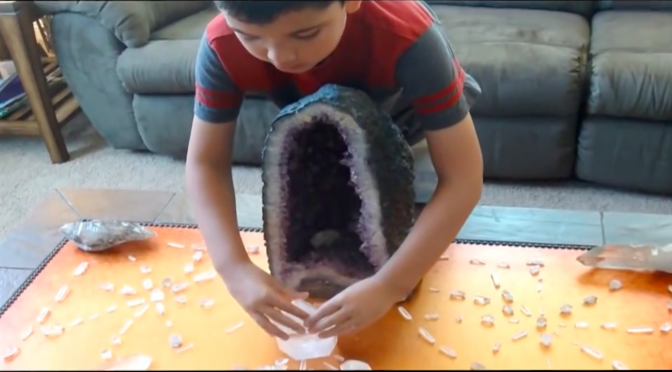 It took Adam about 10 minutes to build this grid which is full of various crystals – Amethyst, Apophyllite, Celestial Smoky Quartz, Clear Quartz points, Vogels, and several Lemurian Seed Crystals. Adam didn't pull the pattern of the grid out of a book or research it on the internet. Instead he chose to listen to the guidance of the stones themselves. What do you think these kids will be doing in even 5 years from now?